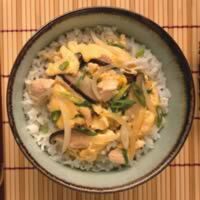 Dashi, a traditional Japanese stock, helps to create this authentic Asian dish. Heat broth, sugar, and soy sauce in large non-stick skillet over medium-high heat to boiling. Add chicken, yellow onion, and mushrooms; bring to a boil. Reduce heat; simmer just until chicken is cooked through, 2 to 3 minutes. Add green onions. Without stirring, slowly pour eggs over surface of broth, covering as much as possible. Cook over low heat 1 1/2 to 2 minutes. As outer edges of eggs begin to set, lift cooked portions to center of pan, keeping eggs in large soft curds as much as possible. Continue cooking, stirring just as needed, until no visible liquid egg remains. Ladle over rice in deep soup bowls.